CS supplied and installed an external solar shading package for the new Ely Leisure Village, featuring a range of custom powder coated accent blades throughout the design and bespoke bracketry to attach it to the existing steel work. The centrepiece of the new £15.76m Ely Leisure Village, which opened in April 2017, features a new cinema along with four in-line restaurant units, offering a brand-new leisure hub North of Cambridge. CS were approached by main contractor RG Carter for the supply and installation of external solar shading – or ‘brise soleil’. With the steelwork already designed and installed, CS needed to design custom bracketry to attach the CS Airfoil Solar Shading system to the building. Working directly with RG Carter and following ongoing site visits by Conspec Contracts, the CS installations team, bespoke bracketry was designed and approved. 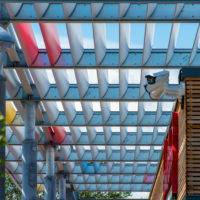 To embolden the design of the building and its façade, CMP Architects wanted the shading solution to make a statement by incorporating different coloured blades throughout the cantilevered brise soleil system. The architects wanted the blades to match the rain screen cladding, which featured randomly positioned coloured accent panels throughout its design. To meet this requirement CS was able to colour match and powder coat a selection of blades to match the rain screen cladding, and incorporate them into the shading system’s design, creating a bold feature. Installed by Conspec Contracts, the CS Airfoil Solar Shading system at Ely Leisure Village achieves the architect’s desire for a high quality, bold design, whilst showcasing CS’ ability to deliver bespoke solutions.